I was browsing through Value Village the other day and came across some antique telephone insulators. I had seen these cool looking glass insulators used in all kinds of craft and garden projects on Pinterest. They were only a couple of bucks each, so I snapped them all up! 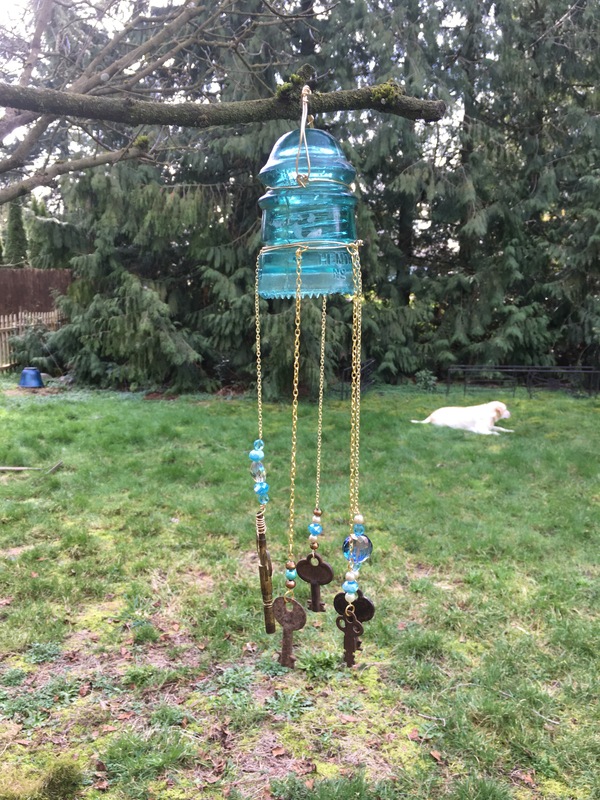 For my first project I decided to make a sun catcher/windchime for my garden. I have a huge stash of beads and jewelry chain so I thought this would be a good way to use up some of the supplies I know I will never use. I also have a huge stash of old keys that I bought on eBay several years ago. I purchased someone’s very old, large key collection for dirt cheap. In the collection there were a lot of antique skeleton keys, but there were also a lot of random rusted broken keys. Since I won’t be using the keys that are in poor condition for jewelry making I chose a couple of them to use for this project. 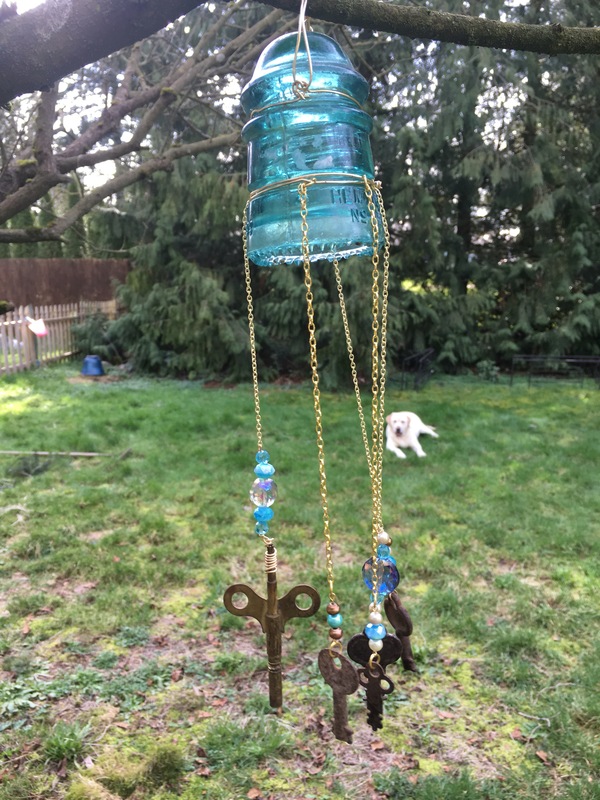 If you want to attempt a similar windchime you just need some wire, beads, jewelry chain, pliers and wire cutters. You can get all of these supplies at the craft store. The other insulators I bought were larger and heavier so I’m not sure if I am going to make more windchimes or make something else like candle holders or other garden art. What do you suggest? Please share you ideas in the comments! One of my favorite recipes to make in the fall and winter is Taco Chili. It is super easy and quick to make. If you are short on time you can whip up this yummy chili in less than 30 minutes. I’m not a fan of really spicy chili so I started using a packet of taco seasoning instead of chili seasoning and it is so tasty I have been cooking it this way ever since. Place a large pot on the stove. Add the ground turkey and cook it on med-high heat. Once the turkey is cooked add the taco seasoning, diced tomatoes and kidney beans. You can add any other veggies you like, these ingredients are just the starting point. Feel free to sneak in some broccoli, mushrooms or other vegetables your kids might not normally eat. Bring the chili to a boil and then let it simmer for 10 minutes. Sprinkle some cheese on top and you are ready to chow down! This is a fast healthy meal your whole family will love. Bon Appetite! I make these cute little diary pendant necklaces in my jewelry shop Crafty Little Gnome. I thought it would be fun to show you how to make one. All the supplies can be purchased at Michaels craft store. 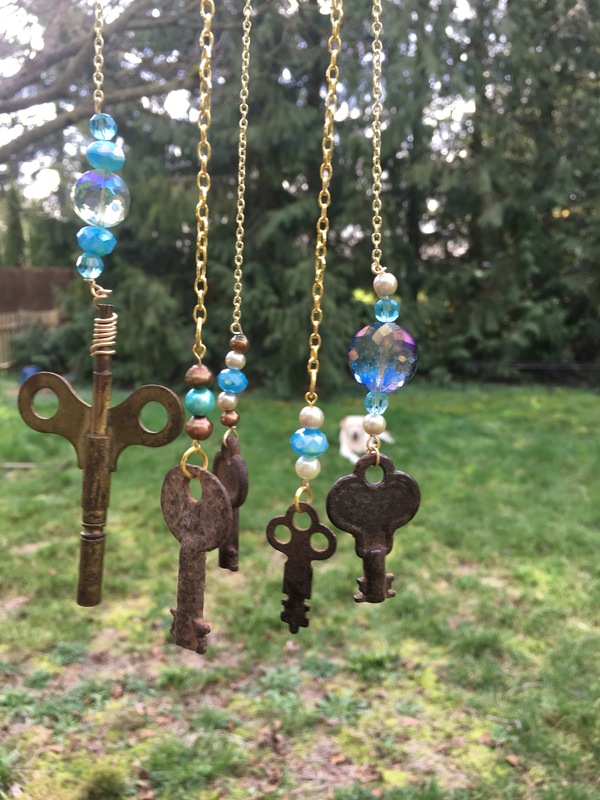 You will need a set of miniature book charms, small metal lock charms, a flat bail that you can glue onto the back, jump rings and a pre-made necklace chain or supplies to make your own. The mini books come in packages of 8. Two of each color (blue, green, purple and blue). They have individual pages inside them, just like a real book! Once the front dries glue a bail on the the back with another tiny drop of super glue. Don’t use too much glue or it will make a big mess. This step is optional but you can print a tiny message out and glue it to the inside of the book. A perfect custom message for someone special! Attach a pre-made necklace chain or make your own with thin brass chain, a lobster claps and some jump rings. It amazes me how quickly time can pass when you are doing nothing! I have often thought it would be great if we could direct the time we spend zoned out in front of the TV or playing on our cell phones into doing something useful. Women of previous generations had a lot going on in their lives. Day to day life was not easy. They didn’t have the modern distractions of watching TV or social media. They had real skills that they learned and handed down to the younger generations. It’s always great to learn new skills and I love trying out new artistic mediums. Domestic arts such as baking, sewing as well as artistic hobbies like painting and photography are making a huge comeback. Not only are these hobbies fun and useful but they are a great way to enjoy some time to yourself and destress. Old school skills are skipping a generation, but baking is officially cool again. This might not seem to be the case if you are stuck in a kitchen already, working hard but for many of us, developing our baking and cake making skills has become a really fun pastime. Baking is a great way to learn about what goes into your food. Its super rewarding to discover that you can create a fantastic batch of cakes, muffins or cookies from scratch! There’s no shortage of information on the web, and it’s so easy to share recipes and tips. Making bread is a useful skill to have. Who can resist the aroma of fresh bread? With so many allergy-related issues these days, baking gluten free bread is just as easy. From French sticks to Ciabatta, and from pizza bases to rustic loaves, baking will make just about everybody happy. Once you have the basics mastered there’ll be no stopping you. You could invest in a bread machine, but baking requires little more than a bowl and work surface. Textile arts were once survival skills of the homemaker. Those were the days before superstores and online shopping. Today though, it’s no longer a necessity. A whole new generation is coming to find that there is real artistic value in developing these skills. Sewing, knitting and quilting are not only a great way of passing the time, but they are a great way of sharing and learning. There is nothing better than sitting around and hanging out while working on a really special project. Quilting, in particular, attracts a loyal and dedicated following. It is a real journey of discovery learning about quilting blocks and starting to create your quilt. There are so many templates or patterns that you can learn from and even adapt. Quilting is a lifetime skill and creating and finishing a quilt you are proud of is a monumental achievement. You’ll need a beginner sewing machine to get started, but after that, the skills you pick up will last forever. There are hundreds of possible sewing projects around the house. How about making cushion covers or oven gloves? If you are feeling ambitious, you could even sew covers for your sofa! I love the simplicity of knitting, and it’s quite addictive. You can invest in a knitting machine, but the real pleasure is just the simple rhythm of the knitting needles. You’ll be transforming wool or yarn into something really special. There is no end to the patterns available, and a wool shop is a treasure trove just waiting to be discovered. Never think that it is too late to follow an artistic route. Maybe you have studied one of these before and would like to get back in touch with your inner artist. Now could be the time. If you are nervous about starting there are excellent online art courses or you could sign up for classes in the New Year. Drawing is as elemental as it gets. You’ll need a few pencils or charcoal and a good quality drawing pad. There are few better ways of gently coaxing your creativity out than studying and drawing still life. Why not go out and try to capture a scene in nature? If you prefer to draw people, there are life drawing classes in most towns. You’ll get to meet and hang out with some amazing artists, who will only be too keen to share their skills and give you encouragement. If you feel like you need some color why not get into watercolor or acrylic painting? Watercolor sets range from inexpensive beginners to top quality professional sets. Again there are all sorts of samplers and courses you can enroll in. You may prefer to simply get a book and try your hand at some guided projects. These can be really rewarding and allow you to get used to working with the medium and understanding things such as color and composition. Photography has been liberated by the internet. Most phones have cameras but for real professional results, it is well worth investing in a digital camera. It might take a while to get the hang of it, but what have you got to lose? There’s no expensive film to develop, and you can take hundreds of pictures. You’ll be surprised when you upload your photographs to find that some will be stunning. These are the keepers and working on a site such as Photoshop, you’ll be able to crop and tint. You can take the results to a copy shop and come away with a fantastic set of prints that you can frame and hang or give away as presents. Getting into a therapeutic hobby can be a life changer. You’ll start seeing the world in a different way. You’ll be able to relax and de-stress and each of these hobbies brings you into the ‘zone’. That is the place where everything else just melts away. Not only that, you’ll meet a whole bunch of fascinating people who share your passion. My husband and I took our daughter on a drive around Bellingham the other night to check out the local Christmas light displays around the neighborhood. My daughter loves Christmas even though she is only two and doesn’t understand what it’s about, but she really enjoys all the light displays and Christmas trees she has been seeing. As we were finishing up our cruise around town my husband mentioned that he was really craving some hot buttered rum and that it had been years since he had any. I had never tried it so we took a detour over to the grocery store to get supplies and high tailed it home to get mixing. Blend all the ingredients except the ice cream in a bowl, then add the ice cream and continue mixing until it is smooth. Take 3 tablespoons of your mixture and place in a mug. Pour a shot of rum over the mixture. You can leave this part out if you don’t drink alcohol. Then fill the cup up the rest of the way with boiling water. Top with whipped cream and a sprinkle of cinnamon. Freeze the leftover mixture until you are ready to use it. This recipe should make 8-10 servings. As we approach the New Year, losing weight and getting healthy will be one of the most popular New Year’s resolutions. There are so many fad diets out there, it can be a nightmare trying to figure out what to do and how to start. The reality is that some diets may work short term but are not effective long term. The most effective ways to lose weight are eating healthily, controlling your calorie intake and exercising. It’s going to take hard work, so forget about those quick fix diets and follow these tips to kick-start your weight loss regime today! Many of us do not drink enough fluids to keep our bodies hydrated. Water, should be something you drink plenty of each day. Most people are dehydrated and increasing your water intake can help with a number of health issues as well as make you feel refreshed and energized. It’s also wonderful for weight loss as it has no calories and can make you feel full. Choosing water over caffeinated or sugary drinks can reduce your calorie intake and make you look and feel better. It’s the most important meal of the day! To start each day right, it’s essential that you eat a healthy breakfast. It can be tempting to skip this important meal when you’re trying to lose weight but eating in the morning can actually increase your metabolism’s performance. A good sized breakfast can also stop you from overeating later on in the day. If you’re not used to having a big breakfast first thing in the morning, start making an effort with a small bowl of fruit. I eat oatmeal for breakfast every morning. I mix in chia seeds, cinnamon and protein powder for extra flavor. After a long, hard day at work, the last thing you probably want to do is go for a run or spend hours at the gym. I have started jogging with my friend every other day before dinner. If you don’t have the time or energy for vigorous exercise try starting out small with a brisk walk or short jog. Just increasing your exercise by 10 minutes per day can really make a difference. It will also reduce your chance of developing health risks and increase your fitness levels. No matter what techniques you use to lose weight, it all comes down to reducing your calorie intake. If you eat more calories than you burn during exercise, you’re not going to lose any weight or reach your goals. Take some time to calculate how many calories you intake on an everyday basis. To healthily lose a pound per week, you should be reducing your intake by 500 calories per day. If you exercise as well you may lose more! To boost your metabolism and help you get motivated, you can replace one meal a day with a nutritional meal replacement option. You can buy these at your local health store or online from Healthy.co.id. There are a ton of vitamins and supplements available. I take a multivitamin, vitamin D supplement, fish oil and protein powder shake every day. Make sure you check with your doctor before taking any new vitamins or supplements. I’ve been looking for some ideas on how to make the transition to an entirely sustainable home. It’s a dream of mine that I hope will happen one day. There is a lot to do before I get anywhere close to complete sustainability! It is, however, very doable, and over time it’s possible for most households to make the switch to an energy efficient home. Here are some of the things you will need to create a sustainable household. It goes without saying that any major renovations to your home are going to cost a lot of money. Of course, most of us understand that it is an investment that will pay off in the end. Over the years, your heating and electricity bills will be so much lower that you will end up saving plenty more cash than you spent. It’s that initial investment that is the tricky part – and it’s out of reach for most people. So, do what you can, when you can. Save a little money for a year or so and see where you are. Once you have a budget in mind, you can start work, pay for it, and then begin saving again. Time will also play an enormous factor. If you have to gut your whole house, the process can take months, or even years! Having a robust plan in place will help, but be prepared to move out of your home for some time if you want the work completed as quickly as possible. If you aren’t paying for everything in one hit, it can take years to achieve your dream. By attacking each little area one at a time, you will soon begin to make serious progress. You will also have to rely on a lot of different people when you start on the road to home sustainability. Builders, architects, rubbish removal services – the list is endless. You may also have to rely on friends and family members, too. You may need somewhere to stay for a few months. There’s a lot to think about – and you have to have a plan in place for any situation that might arise. I wanted to separate this point because it’s important. It’s likely that you will choose a building firm from your local area, but what about the materials? We’re talking about sustainability here, and a big part of that is making sure that you source everything you can as close to home as possible. So, ask around and find a supplier of high-quality materials that you can use. A lot of people are beginning to understand that you shouldn’t buy a pear from South America if you can find one in your back garden, but, when it comes to building materials, they often don’t consider the carbon cost. OK, that’s the basics out of the way. Now let’s take a look at some of the areas of the home that you should look at first. Let’s start in your attic space – as this is where the majority of heat loss occurs. Ensure that you have excellent attic insulation, using natural or recycled materials. You may be eligible for a grant from your council or the government, so it’s worth checking. You can also insulate your cavity walls for added heat-trapping. It can be an expensive process, but it will save you money in the long-run. If you want to save energy in the home, make sure that your windows and doors are up to scratch. Double glazing can conserve your heat, but the main thing is to ensure there are no drafts coming through. Even sash windows can be improved by having seals applied, and will keep warm air in and cold air out. Look at your doors, too. If you can get a new, modern door in place, they are far more efficient at keeping the cold out than older doors. You could also think about hanging heavy curtains in front of them, to give you an extra layer of protection. Don’t underestimate the power of the simple draft blocker. Now that you have sealed your whole house; you can start thinking about different energy solutions. Solar panels are the obvious starting point, as they can make powering your home dirt cheap. They are expensive to install, but the technology behind modern solar energy means you could make your money back within five years. You can also look at the way you heat your home. Underfloor heating, for example, is far more efficient than standard radiators. Again, it can be pricey to install, but you will make your money back quickly. Of course, one of the biggest impacts we can have on our energy use is being aware of our consumption levels. I recommend getting an energy monitor so that you can see what you use with your own eyes. I must say, watching the money burning up in front of your eyes when you turn on the washing machine is an interesting experience! That’s the problem, I guess, because we don’t see the cost when we turn on a light and leave it on all day, but, with a monitor, you will notice every last penny. Finally, make sure that you have regular maintenance on your heating systems and, any other equipment that uses energy. If it doesn’t work properly, it will use up more power than it should. That’s not only bad for the environment; it’s also bad for your wallet. Have you ever seen the TV show Bates Motel? It’s a contemporary prequel to the classic Hitchcock movie Psycho. The show is filmed near us, just a few blocks across the Canadian border in Aldergrove B.C. For those of you who don’t know, Vancouver and the lower mainland of B.C. has a huge film industry. There are a ton of movies and TV shows filmed there. When I used to live in B.C. I got to be an extra a few times. An extra is a person who is in the background of a show. They don’t have any lines, but they are the ones hired as “extra” people in the scene to make it look authentic. I was an extra in the show the L Word where I was part of a crowd at a concert. I was in the movie Martian Child with John Cusack. I was one of the people sitting in the baseball stadium. I was also in an episode of the T.V series Stargate where I played a peasant on a strange planet. I and the rest of the peasants had to make a giant circle, get on our knees and say “all hail the Oraiiii” while we waved our hands. It was hilarious. Extra work can be fun because you get a behind the scenes look at how movies are made. You only get paid minimum wage and the days are pretty long and boring, though. I knew that Bates Motel was filming in that location and we had driven past a few times but they didn’t have the sign up last time I went by. I was going to pick up my daughter from my mom’s house in White Rock B.C. where she was having a sleep over and I decided to take a detour over to see the Bates Motel. I drove right up and parked in front of the Motel set and a security guard rushed over to see what I was doing. I asked if I could take some pictures and he said I had to go across the street and take them off property. I moved my car and got in position to shoot with my phone and then my phone died! I didn’t have the adapter for my charger in the car so I just headed to my mom’s place to get Chloe. On my way back home across the border with Chloe in tow I made another trip to the Bates Motel to try to get some pictures again now that I had charged my phone at my parents house. The sheriff’s truck out front in the picture above is used in the show. I’m not sure about the blue truck though. The little black car out front was where the security guard hung out. He was the one making sure people like me didn’t get too close. It didn’t look like they were doing any actual filming, probably because it was snowing and we only get about two or three days of snow per year in the Pacific Northwest. The set is just on a random street out in Aldergrove. You would never know it was there or have a reason to drive by it if you didn’t travel through that area on a regular basis. Fun fact: the show Smallville was shot about five minutes away from the Bates Motel location. I used to be friends with someone who lived across the street from the barn where they filmed the show. Have you seen Bates Motel? We are currently watching season 1 on Netflix and so far so good. No spoilers please! I have never been a huge egg nog fan, but my husband Rob loves it so I thought I would whip up a batch from scratch just for him. I put a new spin on this classic Christmas drink by using coconut milk! This is my first attempt at making egg nog. Normally my husband buys his egg nog at the grocery store. I was surprised how easy egg nog is to make. Pour the milk and coconut milk into a saucepan on medium heat. Whisk in the eggs and the sugar. Let the mixture simmer and bring almost to a boil (but don’t let it boil). Add the vanilla and nutmeg to taste. Make sure the egg nog heats to at least 160 degrees farenheit or use pasturized eggs for you are really concerned about food borne illness. Allow the egg nog to cool and then chill in the fridge. Add booze if you wish. I don’t really drink so I made it alcohol free but I’m sure Rob will add a little rum. Egg Nog will last up to 5 days in the refrigerator. It’s been a while since I have hosted a Crafty Little Gnome Jewelry giveaway. What better time to giveaway some goodies than the holiday season? One lucky winner will get a jewelry piece of their choice from Crafty Little Gnome! There are several chances to enter. Leave a comment on this post with your entries and a contact email so I can notify you if you are the winner. I want to give a congratulatory shout out to reader Kate who won one of my last giveaways and the Canvas Pop giveaway last month. Girl is on fire! Remember you can’t win if you don’t play so make sure you enter this giveaway. Contest closes January 1st! Good luck! KATE SARSFIELD on Christmas Giveaway!